First Tunisia, then Egypt and now its spreading through out the various countries in the Middle East. This region has been the hot bed for political upheavals ever since World War 2, but what has been happening in the past couple of weeks sure has made this region even more unstable or perhaps this is just the winds of change. The power of the common man has been showcased more than ever perhaps in the events that have now become to called as the “facebook revolution”. The wide spread usage of the social networking sites, in order to unite, co ordinate and plan out on how to go about in trying to attain democratic rights, cannot be missed. The younger generation of the citizens who cannot be bought over by empty promises, they were the ones to step up and boldly speak out against the policies. In both the cases we see that the demand was not supporting any particular leader but instead it was simply against the present form of government and the policies that it had taken in the past. Poverty, unemployment and the disparity between the rich and the poor is what tipped over citizens to seek for change. But what is strange in all of this is why America, the democratic police of the world, have not come in open support for the protesters. 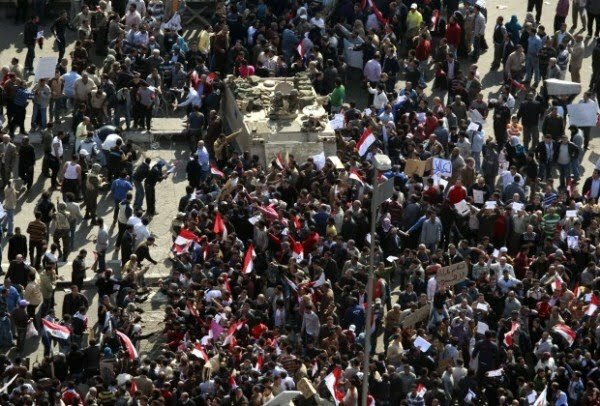 In Egypt’s case, they were seen to be actually backing the president till the very moment they figured that the protesters were very serious about their demands of change and were not willing to back down. What I really cant put my head around is the fact that this is the same country which is fighting a war in this very region for the same cause - Democracy, since after it was proved that there was no WMDs, this was what they thought of. So if I understand the American foreign policy right, they decide on which country will have democracy and which do not? America has had a long history of putting up puppet governments in various parts of the world in various periods of time according to their need for control. The had succeeded in putting such governments in various South American countries in the middle of last century. But there too change came and the people voted for left leaning governments, which by policy would have dictated that they would be against the Americans. But in reality, even though the people had suffered under the oppressive regimes for many years and they would have been perfectly right to blame the US for all of this, they decided to focus on rebuilding the countries, the economy and to hope to give their citizens a better tomorrow. The cold war might be over, the war between the left and right is right now very superficial because right now what every country wants is resources. The country that holds sway in the Middle East is one of the utmost importance. Oil for one is big motivator for a country to fabricate evidence and go into war which has raged on with no end in sight. This is one resource that the entire world is trying to grab. Alternate fuels are still a while away in the future. right now, petroleum is more important than anything else. The other obvious reason of that area is Israel. Yes, to be surrounded by nations who could identify themselves with the Palestinian rights for land and acceptance, they have to be on the constant look out for any developments in the region. But every country right now have their own problems to deal with and I feel that the internal affairs of the countries will be the first priority right now. Israel should use this time to find amicable solution to the problems, and to find if not allies or sympathisers both of which they will not find among the Arabs, but for peace in the region. When the governments stop listening to the very people that they are supposed to govern, then it is the right of the people to demand for a change in the system. Any form of government should know that there is only so much the the common man will take. And yes, the public will bow down and take abuse, but not forever. Modern democracy has to change, to accommodate the voices of the downtrodden and the general masses. The masses that have been flooding the streets in Egypt are not just a section of the society that wants redemption, but instead it is poor, the rich, the young, the aged, every strata of society is being represented in that crowd. A governing system should not be shackled by the interests of few, nor should it ignore the voices of the majority. Change is biological, it evolves with time and as we see today and tomorrow, this time change is here and it is about time the leaders that we allow to govern us know that. A perfect system is quixotic, and it will never be possible, but from this anarchy that is spreading through the streets of Cairo, a leadership will arise, but will it stand, only the sands of time will tell. Prayers to those fallen, prayers for peace and prayers that this change is for the better.